Trying to tame frizzy, damaged hair is the worst. Is there a permanent way to fix it? You might think that frizz is only for a problem for our curly-haired friends but straight-haired gals and all in between will get it too! I do! Fortunately, there’s a keratin treatment called K-Fusion that will fight the frizz AND without damaging your hair. Have you heard of the Brazilian Blowdry? 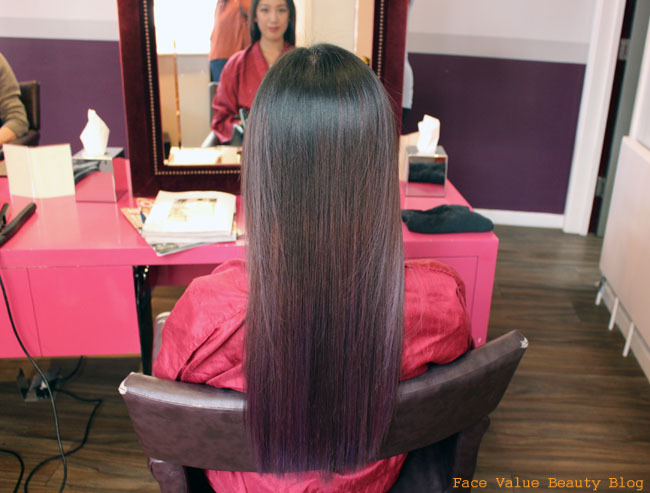 Basically, a semi-permanent smoothing treatment which uses Keratin to replenish and restructure the hair. It can produce some great results but there are lots of horror stories about the negative impact that the chemical ingredients (formaldehyde) has on hair – apparently it’s THE reason why Jennifer Aniston cut her hair into a bob! TOP GOSSIP. 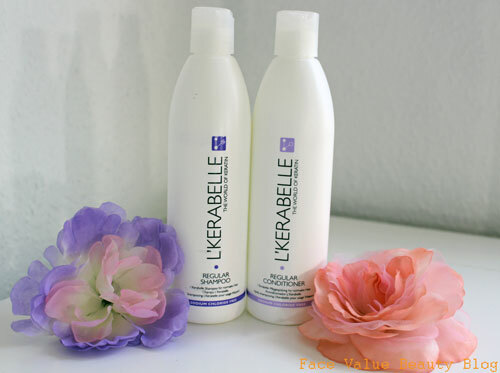 K Fusion by L’Kerabelle is similar, but WITHOUT the horrible chemicals. 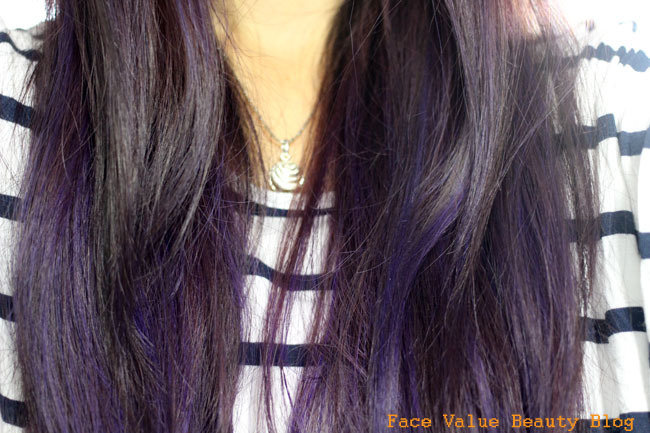 It’s free from formaldehyde and urea, so you end up with semi-permanently smooth hair, that you can style how you like. Yup, it doesn’t have to be ONLY straight or ONLY curly! 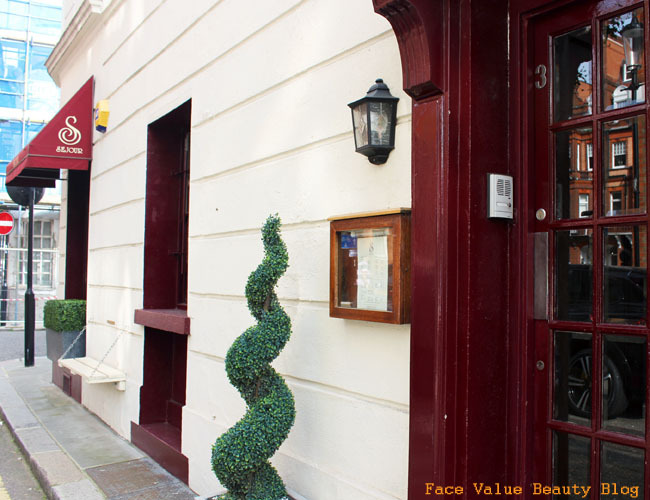 I headed over to Sejour Hair Salon in Chelsea to try it out…. So I wouldn’t say my hair is massively frizzy at it is naturally straight but I never have it dead straight. I tend to sleep with it in a bun, so it develops a bit of wave and it’s definitely not smooth. It’s constantly tangled, with flyaway strands all over the place. So how did it all go down? Firstly, my hair was washed with a clarifying shampoo to remove buildup and oil. And it wasn’t just an ordinary cleanse, the shampoo was left on for 10 minutes. Fortunately, the hair washing station at Sejour salon has MASSAGING chairs so I was happy to stay there as loooooong as possible. 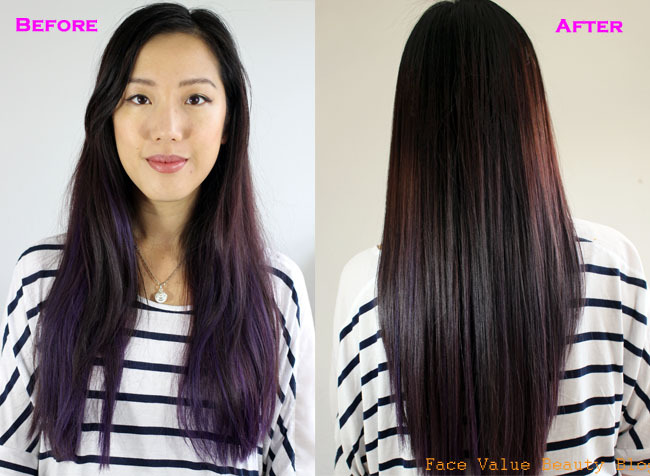 The hair was then dried to 70% and the K-Fusion lotion was applied and painted onto the hair. It was combed through, coating every strand and then left for 30 minutes or so. The keratin lotion smells alright actually! Apparently the Brazilian version has so many nasties, you can literally see the fumes coming off it. After about 45 minutes, it was then rinsed, blow dried and straightened, running the straighteners through each section about 8 times! I was like EEEEEEP, 8 times, it was literally like running nails on a board for me but it needs to be done in order to remove all the moisture from hair and to seal the keratin lotion into the cuticle. Meh, science. Wow. My hair is so shiny, it’s literally like glass. I’m really pleased with the healthy look of the hair, and the feel. It’s literally like each hair strand has been coated in silk. 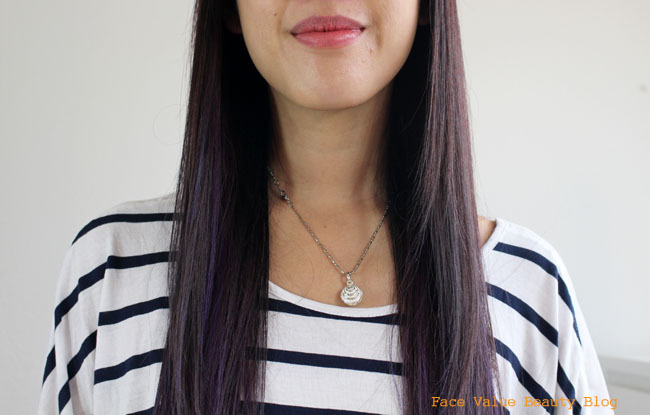 Split ends are less visible and the whole head is smooth. The purple colour has been diluted slightly – but it’s easily replaceable. The Kerabelle website does warn that it will lighten non-permanent hair colour by a shade or two. No biggie, I put my hair through it’s purple paces every fortnight regardless and the semi permanent colour doesn’t impact the results, phew! Maintenance wise, you’re not allowed to wash or style it for 48 hours, in order to give the treatment enough time to bond. For me, it felt really weird to have to have poker straight hair so it was soooo difficult to not touch it! After a day, the center parting with straight hair looked a little bit greasy to me, especially as the smoothness goes all the way up to the roots. But hey, the first 48 hours are the most important as the hair needs time to bond with the keratin. Develop a kink now and you might be stuck with it for a while! 48 hours later: My hair is noticeably heavier and stronger, with a slippery smooth feel and it’s incredibly shiny. If I don’t style it with a bit of movement, it has a tendency to look a bit lank due to the center parting and straight style. I cannot WAIT to wash it. A fortnight later: I realised I had to be careful when applying hair oil as the smooth, sealed hair cuticle is difficult for my usual oil application to penetrate and it ends up sort of sitting on the top of hair, making hair look a bit greasy. 1 month later: Split ends are starting to show again. The initial slippery smoothness has dissipated but the hair cuticle is still noticeably shiny and radiant. 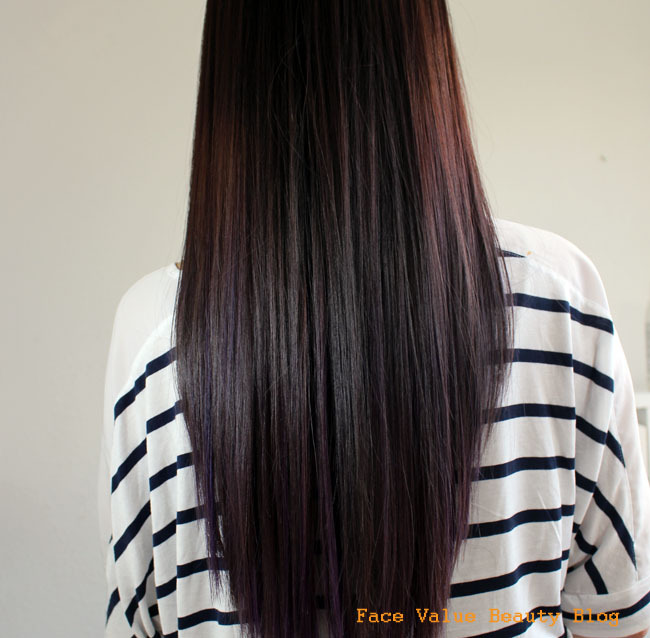 To maintain the finish, you need to use products that are free from sulfates. You should try and do this ANYWAY, but especially if you have treatments. Overall, I’m pleased with this but not blown away enough to make this a regular thing. Because my hair is naturally a bit straighter, I don’t think I’ve seen the full benefit. If I had naturally curly hair though, this would be a no brainer – you definitely end up with more manageable, straighter, smoother, shinier hair – which you can style as you like. Ideal. The biggest change for me is definitely the shine – it’s 100% shinier than any other treatment I’ve used before. The static flyaways are still there, but resolved by brushing with a metal brush. My lovely stylist Amal El-Hassani told me that she much prefers the K Fusion Treatment to the original Brazilian Blowdry. (obviously not being gassed is a big plus) But do the results differ between Le Kerabelle Keratin treatment and the Brazilian Blowdry? Amal explained that the Brazilian Blowdry is a more of a relaxer, it’s more powerful for really curly hair but it’s also more damaging. So if you’re not looking for some serrrrious straightening, then Le Kerabelle K Fusion is definitely your one. Big thanks to Sejour Salon for letting me try this treatment! What do YOU think of the results? Is frizz a big hair concern for you? Tweet me your thoughts @FaceValueBlog or send me a comment on Facebook! NEW HAIRSTYLE! I Cut My Long Hair Off And Ended Up With..
Next Post VIDEO: Forget Beauty Boxes, Make Your Own Personalised Beauty Hamper!